Awarded Trip Advisor Certificate of Excellence 2013 La Torre Golf Resort. The villa is just a 5 minute walk to all the facilities, the perfect holiday for both golfers and families alike. 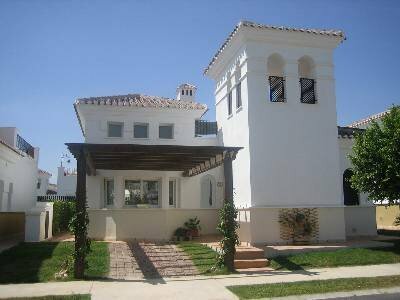 Welcome to our beautiful detached 2 bedroom villa situated on the luxury Polaris World resort of La Torre, on the Costa Calida’s “Warm Coast” region of Spain. La Torre is a large gated community, with 24hr security and a wide variety of facilities that make it the perfect holiday location for both families and golfers alike. The resort boasts an 18 hole Nicklaus Design golf course, 15 communal pools, Childrens play areas, tennis courts, restaurants and bars all within 5 minutes walk from the villa. The resort also has a 5 star Intercontinental hotel which will include a luxury Spa. Just 2 mins walk from the villa you will find a well stocked resort supermarket which bakes bread daily. All guests at the villa will receive discounted golf green fees, the club also frequently has "green fee deals", please contact the owner for all the latest offers. The villa is built in a “bungalow style” with a large roof terrace, private garden and outside dining area, and has been furnished to a high standard with a modern feel throughout. The villa now also benefits from having wireless broadband connection, which gives free WIFI access to all guests during their stay. The living accommodation consists of two twin en-suite bedrooms overlooking the garden to the rear of the villa. Both bedrooms have a stylish contemporary design and are complete with built in wardrobes providing ample storage space. Each room has air conditioning and separate central heating system for your comfort all year round. For our younger guests cots are available by request free of charge. The bathrooms are in immaculate condition with fully tiled walls which continues the modern style. The bathroom adjoining bedroom one has separate shower, modern sink/storage unit, W/C, heated towel rail and shaving point. Bathroom two has a bath, sink, bidet, W/C, heated tower rail and shaving point. The spacious air conditioned lounge/dining room has a dual aspect with patio doors to the rear of the villa leading onto the outside dining area. Continuing with the contemporary feel, the room has been decorated with modern furniture and fittings, including 2 & 3 seater leather sofa and 32” wall mounted LCD TV with English TV including BBC. A selection of DVD’s and games are also provided for your entertainment. The dining area to the front of the villa is complemented with dining table and chairs to accommodate 4 guests. The patio doors from the lounge lead outside onto the private garden & patio area with table and 4 chairs, complete with gas BBQ ideal for ‘al fresco’ dining. The impressive kitchen and utility room are fully equipped with all modern appliances, including electric oven and hob, microwave, fridge/freezer dishwasher & washing machine. For all guests convenience there is ample cutlery, crockery and glassware. With all the living area situated on the ground floor, the villa boasts an impressive spacious roof terrace, complete with 4 sun loungers so you can enjoy the beautiful Spanish sun all day long or watch the sunset with a glass of Sangria in the evening! The Resort has all the facilites you could wish for, including an 18 Hole Nicklaus Design Golf Course, tennis courts, childrens play areas, communal swimming pools, clubhouse, Bars, restaurants, hotel & spa, shops & supermarket. The golf course is a typical "Nicklaus" design with more empthasis on precision rather than power. There big feature of the course are the vast bunkers and water hazards. There are 4 sets of tees, which makes the course suitable for players of all abilities. The course is part of the "Nicklaus Golf Trail" which means as a guest at the villa you are entitled to play any of the other Polaris World courses at the discounted residents rate. Currently there are three further courses to play at the Mar Menor,El Valle & Hacienda Riquelme resorts, all within approx 15 minute drive from La Torre. The resort also have a free shuttle bus service between the resorts, this is particularly useful if you do not have a car during your stay. The town centre and central plaza are situated around a large lake and is the ideal place for adults to have a drink and relax whilst the children are able to play safely. This area boasts a number of bars & restaurants serving a variety of quality food and drink, including an Italian, Tapas, Paella / traditional Spanish, Irish Bar & Ice-cream Parlor providing all you need on your doorstep. However for the more adventurous local towns are within a 10 minutes drive. Pinos Bar - Cocktails, Sky Sports, & Childrens entertainment! Within easy reach of the resort you will find many outdoor activities such as Horse riding, Hiking and Cycling, together with numerous water sports to be found on the Mar Menor and Mediterranean. You will find the beautiful sandy beaches of the Mar Menor which stretch for miles are just a 10 minute drive away, and the still shallow waters are ideal for children, or for those who enjoy walking the promenade along the beaches is the perfect way to relax. For the whole family to enjoy there are 2 large Water Slide Parks nearby, Aqua Natura in Murcia and Aquapolis in Torrevieja, both offer fantastic thrill rides together with childrens play areas. The nearby town of Los Alcazares (10 mins) is a great place for beaches & restaurants a few of our favorites are RUN (Asian/Thai), La Diva (International cuisine), Penny Farthing (Great English Breakfast) all are located in the main pedestrianised square area. The historic cities of Murcia & Cartagena are within easy reach by car, both cities are very good for shopping. About a 30 minutes drive is the traditional fishing village of Cado de Palos, the restaurants around the harbour are well worth a visit, especially for those who like their fish & seafood !! As well as the 4 Polaris golf courses there are also many others in the region, including La Manga Club (3 courses), Roda, Serena, Mosa Trajectum & La Finca. I am a keen golfer myself so please feel free to contact me if you need any further details. The villa is located approx 100 metres from the 5th & 6th fairway, with just a 5 minute walk to the 1st tee. The villa also has broadband facilities.